Telecom operator Bharti Airtel on Thursday reported a 72 per cent drop in consolidated net profit for the quarter ended December 2018 at about Rs 86 crore from Rs 306 crore, posted in the same period of the last financial year (2017-18). The telco’s close shave with net loss was saved by deconsolidation of Airtel Payments Bank worth Rs 1,017 crore. Brokerage firms had expected a net loss of about Rs 1,000 crore for the second-largest telecom operator. Motilal Oswal Securities had anticipated a loss of Rs 520 crore for the operator. Kotak Securities had projected Airtel’s quarterly loss at Rs 990 crore. 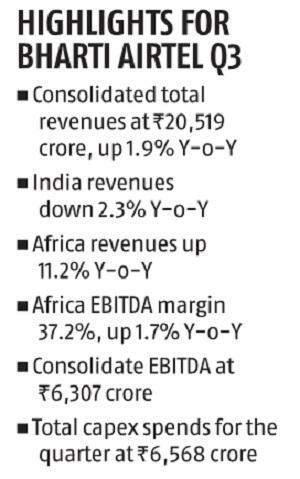 Exceptional gain during the quarter ended December 31, 2018, was Rs 1,017 crore, largely on account of deconsolidation of Airtel Payments Bank as the latter ceased to be an arm of the Group and became an associate of Airtel from November 1, 2018. The company’s total revenues remained flat at Rs 20, 519 crore during the quarter, the India revenues declined by 2.3 per cent to Rs 14,871.3 crore as against Rs 15,394.6 crore in the year-ago period. While the average revenue per user (ARPU) declined 15.5 per cent to Rs 104 on year basis, the same increased 4.1 per cent sequentially (July-September period). The consolidated Ebitda (Earnings before interest, tax, depreciation and amortization), stands at Rs 6,307 crore. The company’s year-on-year (YoY) data usage per customer doubled to 10,528 megabytes (Mbs) and the voice usage per customer rose 26.7 per cent to 726 minutes during the quarter as against 575 minutes in the same period last year. “Our simplified product portfolio and premium content partnerships have played out well during the quarter. Our mobile data volume continues to expand with an YoY growth of 190 per cent. Effective this quarter (January-March), we have modified our customer base measurement to represent only transacting and revenue generating customers,” Gopal Vittal, MD and CEO, India & South Asia, Bharti Airtel, said. 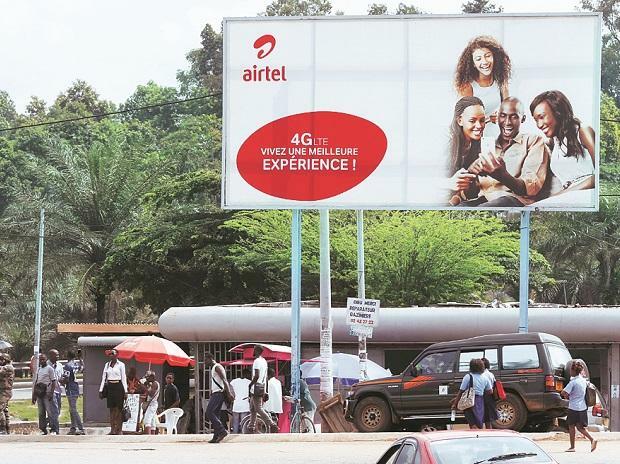 Airtel Africa’s gross revenue grew by 11.2 per cent on year basis to $853 million as compared to $767 million in the corresponding quarter last year, led by 12 per cent revenue growth in data and Airtel Money in the African content. Bharti Airtel that has operations in 18 countries across Asia and Africa said Qatar Investment Authority (QIA), a sovereign wealth fund of the State of Qatar, has agreed to invest $200 million through a primary equity issuance in the company. The proceeds will be used to further reduce Airtel Africa’s existing net debt. Currently, Airtel’s overall debt stands at around $15 billion. Airtel Africa subsequently intends an initial public offering (IPO) and use the proceeds primarily for further reduction of debt.